Kansas City BBQ is thataway! 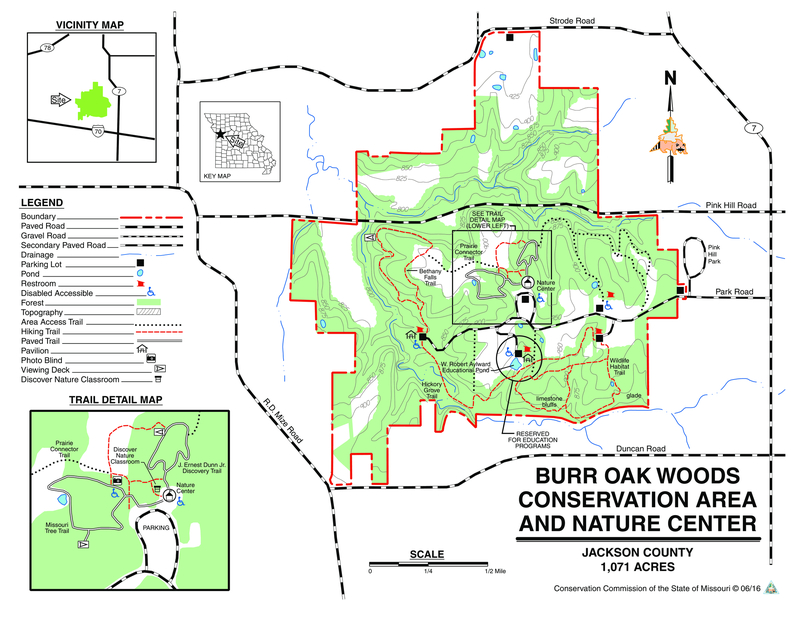 Burr Oak Woods Conservation Area is a 1,071 acre Missouri state park in Independence, just east of Kansas City, and just north of I-70. Burr Oak Creek, which flows through along the west and south edge of Woods, gives the nature center its name. There are prairies and wetlands, but Burr Oak Woods is mostly forested small, but steep, hills. It has large limestone boulders and outcroppings. The education center includes a 168-seat auditorium and 3,000-gallon aquarium. Picnic areas, restrooms and parking lots are dotted along Park Rd., the road through Burr Oak Woods. But what about the hiking? 1) Missouri Tree Trail: A 0.75 mile concrete loop adjacent to the nature center. Includes prairies, a pond, and many labelled flora. 2. Dunn Discovery Trail: A 0.5 mile paved loop, also adjaccent to the nature center. Fun education for the kids. 3. Wildlife Habitat Trail: A 1.5 mile gravel loop, that educates hikers on how forest management improves forest health and wildlife habitat. There is a limestone bluff and a pond. Can also be done as 0.9 mile loop. 4. Bethany Falls Trail: This 1.33 mile gravel lasso is one of the highest rated hikes in the Kansas City area. It includes woods (of course), savannah, prairie, an old homestead and the Bethany Falls limestone outcrop. 5. Hickory Grove Trail: A 1.15 mile (one way) gravel trail, which connects the Wildlife Habitat and Bethany Falls trails. It roughly follows Burr Oak Creek. 6. Prairie Connector Trail: A 0.5 (one way) trail which connects the Bethany Falls Trail, Missouri Tree Trail and Dunn Discovery Trail. There are also some formal, but unnamed, trails just east of the education building. From Kansas City, head east on I-70 to exit 20. Head north on Highway 7 for 1.3 miles. Turn left (west) onto Park Rd. Park at whichever trailhead is closest to where you will start your hike.